mother and firstly gave a name as “Kao-Kae”. Leaves are pretty curve down and twist like Dorset Horn, shiny, thick, white border and inflate white bone. Each branch has many frequent internodes and compact or dwarf style so we can grow and maintain her to become Bonsai. Flower has 15-25 red or pink lines in the throat. side. However, his descendants are often lazy and flowering stem is too long so that the election continues to be intensive. 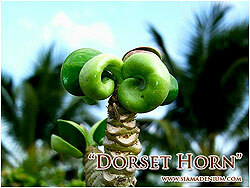 As I knew, this “Dorset Horn” characters was happened in Taiwan 6 years ago. Taiwanese breeder named this as “Miniature” or “Mini-Size”. 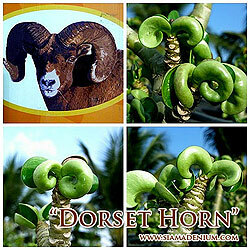 “Miniature” mutates from Adenium Obesum. 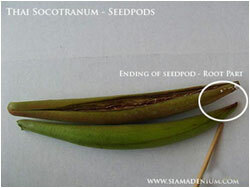 The differences are leave bigger, less curve or twist; flower has no 15-25 lines in the throat and grow faster. 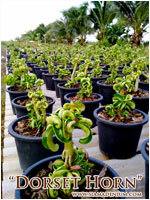 Most growers think “Koa-Kae” and “Miniature” are the same but actually they are totally different species. 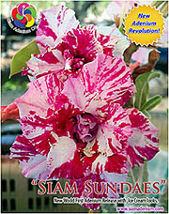 See the left photo for Kao-Kae flowers. What a big difference between “Miniature” and “Kao-Kae”? 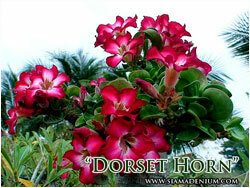 “Kao-Kae” cannot get stability on leave, branch and flower when make grafting on any adenium rootstocks. After grafting, leave will change from curve down to straight like normal obesum leave. Branch will get longer, not compact and get more distant internodes. Flower also gets back like normal obesum flower. “Miniature” will be the same as parents after grafting. From these above, I can say true “Kao-Kae” is one of the rarest adeniums and be available in Thailand only. Now we have true “Kao-Kae” available in Air Layering or cutting, to ensure stability, with healthy roots, 6 inches tall, and 1.5-2 cms diameter stem. Please email me if you have any questions or need more information. Thanks a lot and have a nice day.